The result might be expected to be a slightly compromised version of the original vision, as Will Alsop feared – but it isn’t, its brilliant! As Shelagh told us, when the sun comes out, as it occasionally does in Bradford, something magic happens. And on que, just as the presentations to the Academy finished the sun came out and the atmosphere changed as the space filled with happy relaxed people. 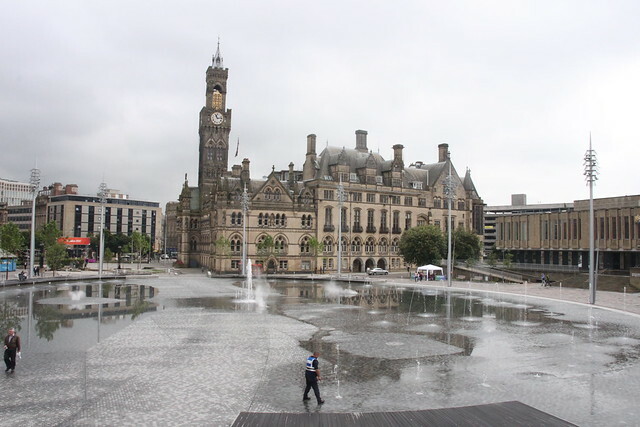 As we were told Bradford people are still learning how to use the space, exploring its possibilities and (there is no other word for it) playing. This is helped greatly by a hands-off style of management. Before it opened there was a great deal of debate about issues like alcohol, skateboards and bikes and anti-social behaviour. The brave decision was to say that the management would only intervene to prevent behaviour that risked damaging the space or harming its users. We watched kids circling in the water on BMX bikes and at lunch time people in the surrounding bars were drinking alcohol. The mix of people however means that no one group dominates the space and so far at least happy balance is being maintained.